A perfect location inside the perimeter (ITP) and direct access to I-85, Camden St. Clair has one, two, & three bedroom apartments only 3 miles from Emory University & Hospital and close to Sagamore, Briarcliff, North Druid Hills, and Buckhead. Our one, two and three bedroom ITP apartments include a full-size washer and dryer, stainless steel appliances, cherry wood cabinets with brushed nickel hardware, ceiling fans, and spacious walk-in closets. Some apartments even have custom details like built-in bookshelves, crown molding, tray ceilings, spacious walk-in closets, and fireplaces. Whichever floor plan you choose, you will love living at Camden St. Clair. Enjoy working out in our newly renovated fitness and yoga center that includes a punching bag, mingle with your friends in the resident lounge or sit down for a card game or pocket billiards also known as bumper pool. Take a dip in our refreshing salt water swimming pool or show off your pit masters skills on the gas grills. You always have a quiet place to get work done in our onsite business center. Our pet-friendly community offers an off-leash dog park with agility equipment and benches for you to watch your dog play. When you need to give your furry friend a bath or need a little extra grooming, Kiki’s is right around the corner. We have you covered if you are in need of your own personal garage. Availability and location could be right outside your door. Take care of your car at the on-site car wash, and no more digging for change because you can vacuum the interior of your car or fill up your tires with air for free. Breathe easy because all of our amenity areas are non-smoking. Our beautifully landscaped community is only minutes away from popular dining and shopping areas. We are walking distance to Mason Mill Park, gas stations, banks, IHOP and Urgent Care. The MARTA Bus Stop is at the entrance of our community and other frequently visited locations like Super Target, Costco, and Walgreens are just around the corner. Residents receive a technology package included in the total monthly rent with a savings of up to 45% off retail. This money-saving package includes high-speed internet up to 150 Mbps and over 140 digital video channels through Xfinity. Use the Xfinity Go app on your smartphone or tablet to access your digital video anywhere! A beautiful community with so many conveniences; come home to our ITP apartments at Camden St. Clair. Get the perfect spot! 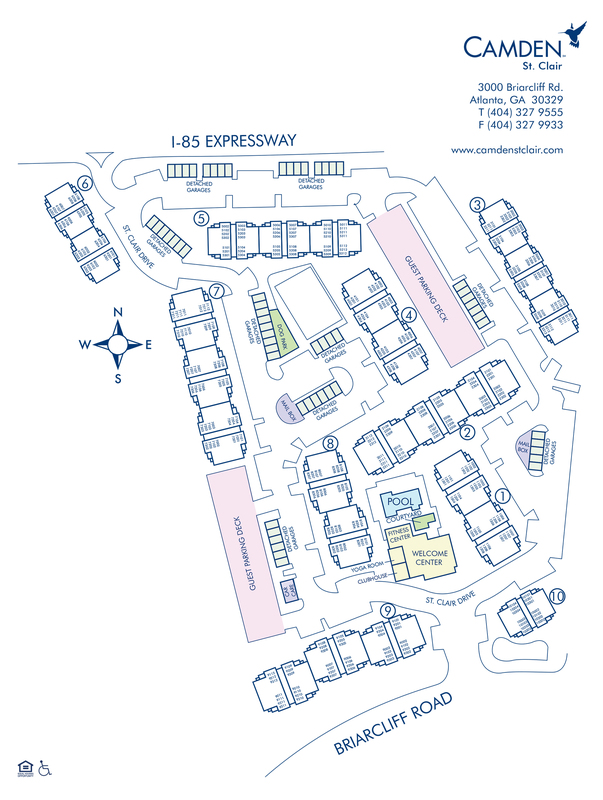 We have ample open parking in our parking decks for our residents and visitors on a first-come, first-served basis. Garages are available too! Detached garages are available for $100 per month.